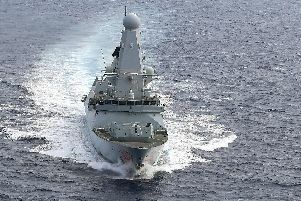 CHILDREN in Bahrain have been marvelling at the firepower of a Royal Navy warship from Portsmouth based in the country. Eleven youngsters were given a tour of HMS Ledbury – and were able to get up close and personal with the minehunter’s 30mm cannon. The children, who were all part of the Bahrain for All charity, were then treated to lunch on board the vessel. Lieutenant Commander Claire Thompson, Ledbury’s captain, has just arrived on the ship with her crew and said events like this were ‘really important’ in highlighting to locals what the navy does. Ledbury is part of the Royal Navy’s permanent presence protecting the Gulf. Crews rotate throughout the year.